Located in Kunfunadhoo Island at a distance of 110 km north west from the capital, Male; the Soneva Fushi Resort and Six Senses Spa strikes a balance between the natural beauty and excellent comforts. Flanked by white sand beaches that meet an azure blue sea, Soneva Fushi proudly stands on a 100 acre island that is among the remotest islets from the capital Male. So, traveling to here and exploring this islet is seriously no less than an adventurous itinerary. Your this challenging thrill starts from an exciting 30-minute picturesque seaplane flight from the Male’ International Airport. 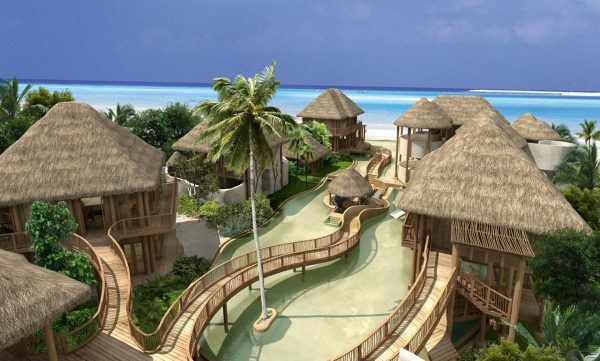 The resort looks more as if it is a Robinson Crusoe epitome, but, you are always offered the ultramodern facilities. So, this legendary resort is surely worth a visit. You might be a bit worried about the remoteness of the Soneva Fush resort. But, let me tell you that its seclusion is the main factor that makes its appeal offering the ultimate resort experience on a 1.5 km island. So, your senses will be lost as you experience luxury amidst natural beauty. This is the real secret of this destination. 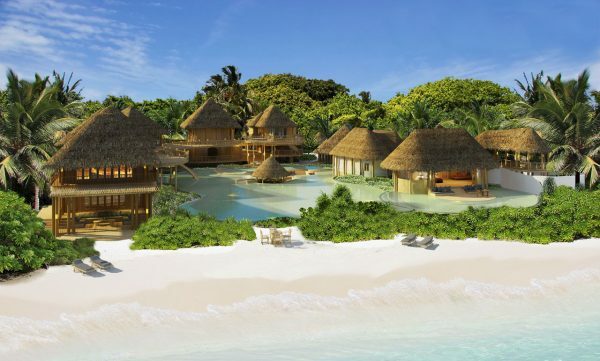 The Soneva Fushi offers 65 accommodations all with backdrop of the lush jungle facing towards the encircling lagoon. 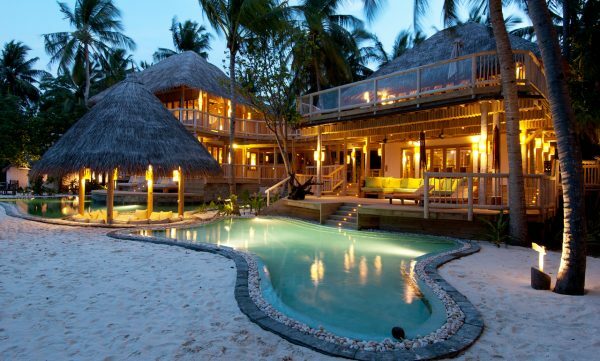 There are 24 villas with private pools, the Jungle Reserve, and The Retreat with the first tree houses of Maldives. 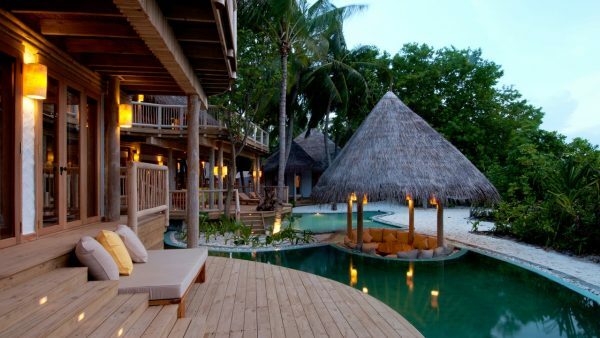 So, Soneva Fushi very smartly grabs the essence of a remote hideaway and nature’s fascination. This resort is unique in this matter because it produces maximum of its own crops, vegetables, and fruits in its gardens. Therefore, you can expect a multitude of dining options along with a myriad of restaurants. You will be delighted to have all types of cuisine it offers. And if you are a gourmet, then this is something not to be missed. So, do plan for your visit to this resort. Without this, no resort is complete in itself. I mean this is one of the most necessary components of a resort. And if you are in Maldives, there is no doubt that you will surely have these two. Do you know that Maldives is the island famous for snorkeling and scuba diving? In fact, it is regarded as the paradise for the two. So, the resort cannot be without this offer. You are free to choose your own thrilling dive sites. To take care of this outdoor activity, the resort possesses its fully-equipped PADI diving school. Now, the two water sports are not the only option. You can still check out for the other varieties of water sports such as water skiing, canoeing, windsurfing, and hobiecat sailing. If you are tired of water sports or do not to get wet, but still want to experience some recreation, then tennis court, volleyball, badminton, and table tennis are your options supported by the resort. One of the most interesting options is to amble with the nature for your discovery excursions on the island and the adjacent island hamlets. I am sure all these activities will surely take you out of your tension and will make you feel awesome on your vacation time. This spa really keep its name by invoking a sixth sense in you. After a range of tiring days, you earn some time for holidays in which you must always consider going to a spa for revival. A spa enables you to maintain your health, remove stress, and look at life positively. A resort is even more appealing with its service of spa. As per this spa, a truly holistic approach for health and happiness brings mental and physical balance. The term holistic here stands for those treatments that consider all the features of the customer – the physical, emotional, mental, and the spiritual aspects. On this belief, the spa centre has come up with a menu of cautiously selected treatments to meet the expectations of each guest who might not be looking for only relaxation, but also for treating more serious diseases. The spa also has a myriad of beauty treatments that involves a well-equipped and air-conditioned gym, Sauna, Steam Room, Yin Yang Jacuzzis, and WATSU Pool. If you continue your journey further in East Asia we recommend private villas for rent in Tay Ho, it guaranteed you will enjoy a memorable holidays there. Siem Reap new homes: Tip where should you start?